Q. How do I get my 32 gallon Trash Knight™? Our 32 gallon products can be delivered locally for a nominal fee in assembled form with cans if preferred and UPS shipped elsewhere in take-down form. 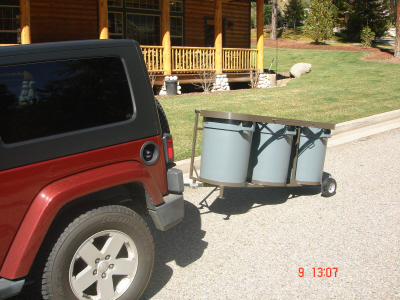 Products shipped out of area require some assembly and the local procurement of 32 gallon Rubbermaid BRUTE™ trash cans (Home Depot-about $30.00). Fully assembled units with or without cans are also available for shipping via truck for significant additional fee. Please feel free to contact us for a shipping or delivery quote. Q. How do I get my 96 gallon Trash Knight™? The 96 gallon units are also delivered by us anywhere in the San Joaquin Valley for a nominal fee. We assemble them based upon their storage location in your yard. At this time, they are not available in takedown form, but we can truck ship them to any location. This will necessitate some brief measurements of your cans to ensure proper fit and a sizeable shipping fee. Multiple unit orders (example: a group of neighbors in a subdivision with long driveways) may be able to get special shipping rates. Please feel free to contact us for shipping/delivery information. Posted on December 1, 2014, in Uncategorized. Bookmark the permalink. Leave a comment.